Portable Baseball Batting Cage provides double netting behind the batter. 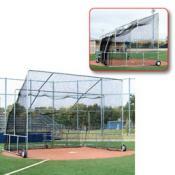 Extra width accommodates left or right hand hitters without shifting the cage. It has three 16" diameter, 6" hub, ball bearing, multidirectional pneumatic wheels. The back wheel features a unique lever device for easy mobility. It is constructed of 2" O.D. Flo-coated galvanized steel. The netting is heavy duty, 3.5mm, weather-resistent polypropylene cage netting. Size 18' W x 12' D x 12.5' H. Weight: 550 lbs. Replacement nets are Heavy duty, weather-treated # 600 netting. Break strength over 300 lbs. Replacement dolly for both BS4000 and BS4000F. Consists of cross brace fittings, handle, wheel, etc. Everything you need to add or replace a system to your backstop.